On January 5th, I was able to help out with a Christmas Bird Count at the Avon Park Air Force Range in Florida. This CBC is entirely conducted within the Air Force Base. Our team consisted of Reed Bowman, Shane Pruett, Anna Fasoli, Jenn Smith, and myself. We started the day off at 5:45am, trying a few locations for Eastern Screech-Owl. We didn’t get any to respond but Barred Owls were calling at various locations. We did end up hearing two screech owls later in the day. We drove over to a dike through a large wetland area to be there for sunrise. In the last minutes of darkness, we were able to hear King Rails, Common Moorhens, Mottled Ducks, and various other wetland birds calling. Once the sun rose, we were surrounded by Swamp Sparrow and Common Yellowthroats. 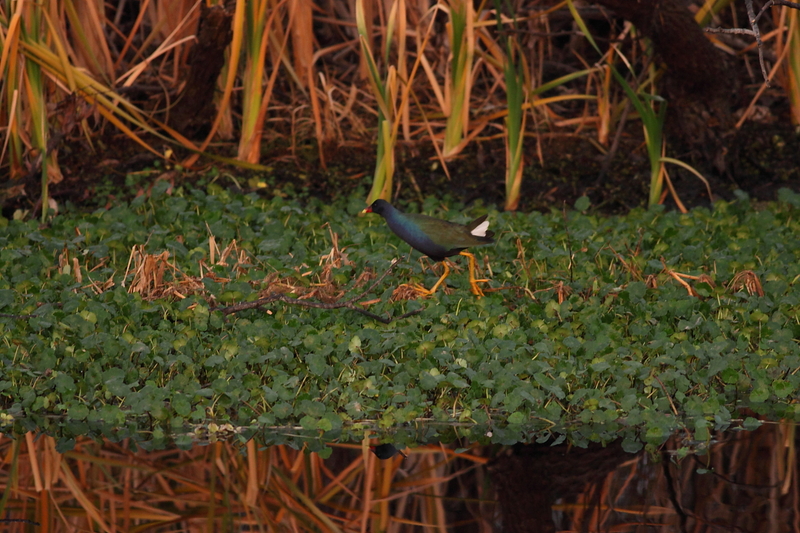 Jenn Smith spotted a Purple Gallinule among some Common Moorhens. Various egret and heron species were flying overhead. Shane Pruett spotted a Northern Waterthrush foraging in some tangled brush along a small creek that ran through the marsh. 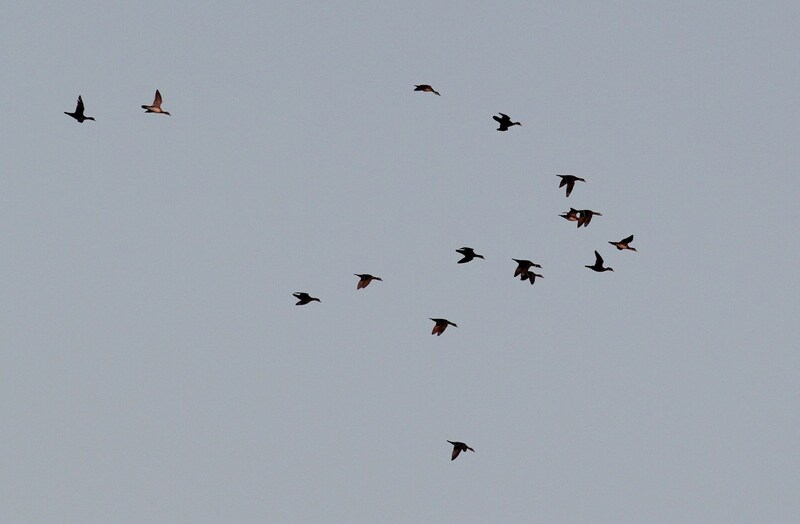 Red-winged Blackbirds were lifting out of the marsh in massive numbers, we estimated at least 8000 blackbirds! For the next few hours we walked through areas of Bald Cypress swamp searching for warblers and whatever else we could find. 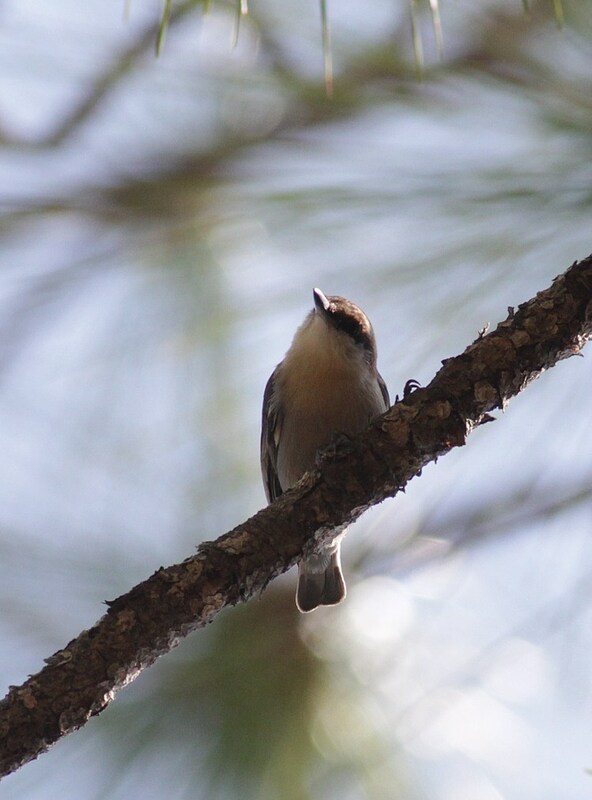 At one location, we picked up Pine Warbler, Yellow-rumped Warbler, Yellow-throated Warbler, Palm Warbler, Prairie Warbler, Black-and-white Warbler, and Common Yellowthroat as well as White-eyed Vireo and Blue-headed Vireo. Some other areas of Pine and grassland produced Brown-headed Nuthatches, Hooded Mergansers, Chipping Sparrows, Eastern Towhees, Common Ground-Doves, and Eastern Meadowlarks. At one stop, overlooking a large empty agricultural field, we had a flyover flock of 40 Horned Larks. This is a species that has never been recorded at Avon Park and is fairly rare for southern Florida. 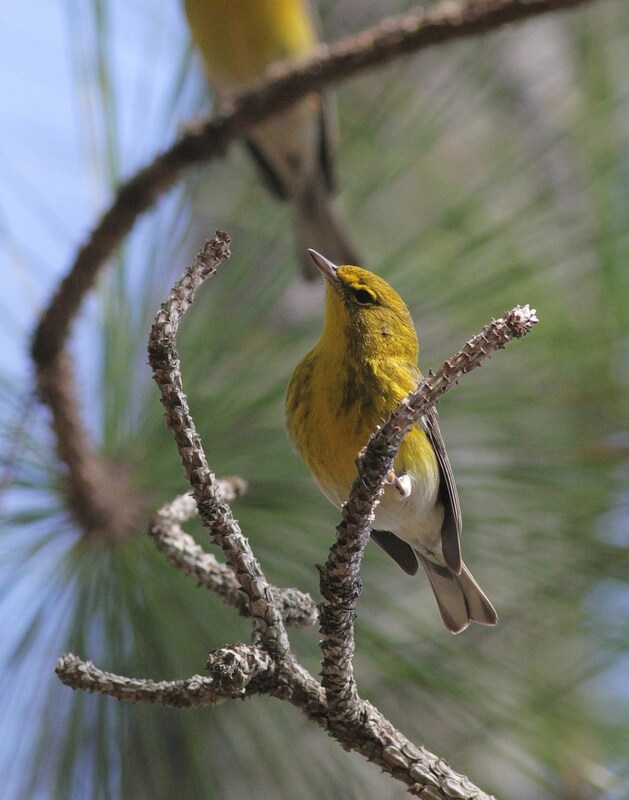 Pine Warbler, Palm Warbler, and Yellow-rumped Warbler were at each stop we made with Pine Warbler being the most plentiful. We were doing pretty well for woodpeckers, and at one stop we picked up both Red-headed and Hairy which meant we had seen all of Florida’s woodpeckers except for Red-cockaded which does breed on the Air Force Range, but not in our CBC block. 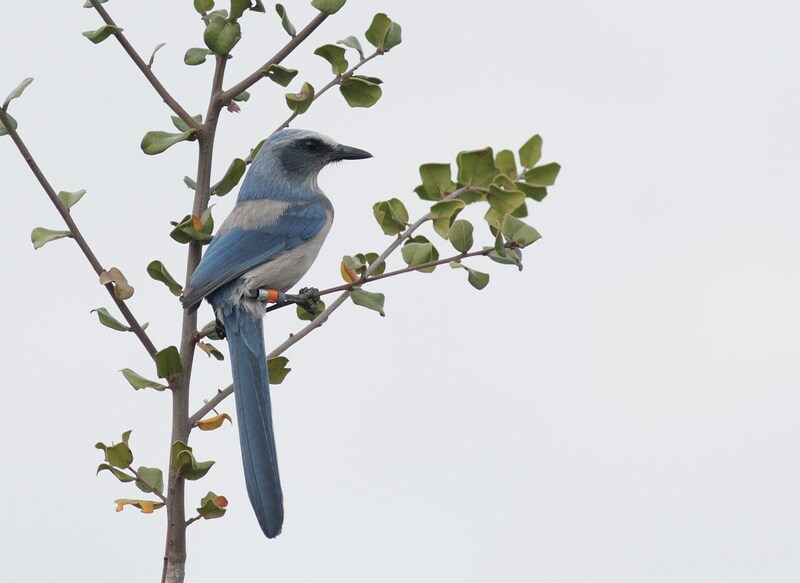 Another location in great scrub habitat produced four Florida Scrub-Jays which came in close to check us out. Raptors species were numerous with Turkey and Black Vultures everywhere; American Kestrels and Red-shouldered Hawks quite numerous; two Red-tailed Hawks; one Peregrine Falcon that Anna spotted soaring over an agricultural field. Near the spot we had the jays, we saw an adult and 4th year Bald Eagle chasing each other through the air. 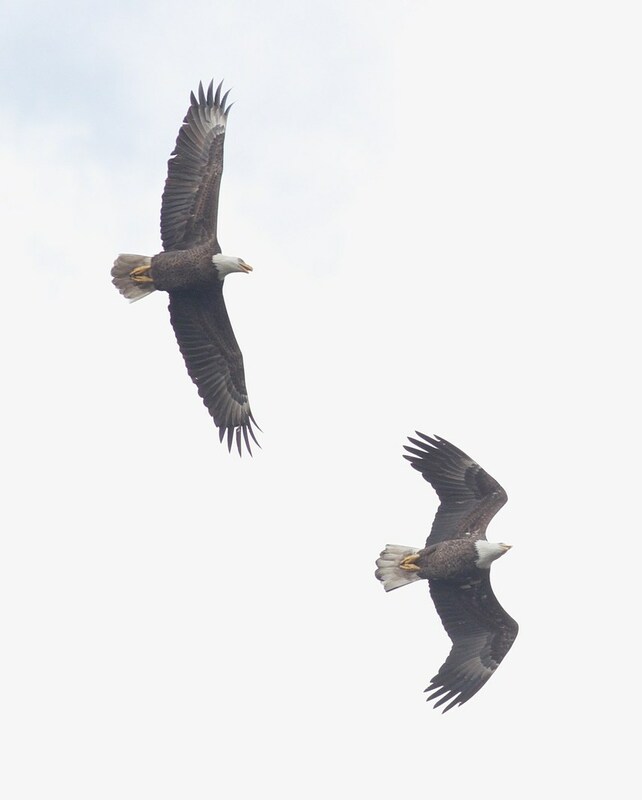 The eagles flew right over out car, so I was able to get some nice photos of their aerial dogfight. We ended up seeing 4 Bald Eagles throughout the day; two adults soaring near each other, and these two birds fighting each other. We had picked up pretty much all the species we could, but still needed two easy ones: Snowy Egret and Cattle Egret. We decided to swing around through some open ranchland to try for Cattle Egret, but amazingly had none. Our last hope was to go back to the marsh we started the day off with and see if a Snowy Egret was present. No Snowy Egret was found, but we did add Belted Kingfisher and Wood Duck. Flocks of Wood Ducks were passing in decent numbers on their way to a roost site. The sun finally set and our CBC birding day was over. We ended with 87 species of birds! We also had a decent assortment of butterfly species. 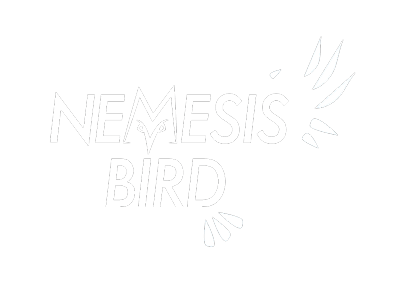 Below is a complete list of the bird species we saw. For more photos I took during the CBC, visit this link and check out the photos towards the end of the album. Wood Duck 135 – Flocks seen flying to roost location at sunset.